A water pump, a power plant, an Extraterrestrial landing strip, a beacon, a weapon, an observatory, a tomb - these are some of the labels assigned to the Great Pyramid of Egypt. But there is one idea that has not been presented or explored, and it is possibly the simplest of all: that it was designed and built to represent us. The Human Body: Our Spiritual Anatomy. 8) The four elements of Earth, Air, Water, and Fire. A secret "thirteenth" sign containing the other twelve within itself. Chakras, or the body's seven energy centers. 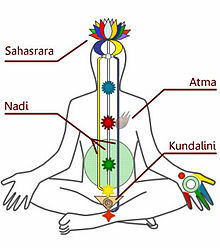 Kundalini, most often described as a coiled serpent existing within the body in conjunction with the chakras. Androgeny (i.e. two genders in one). 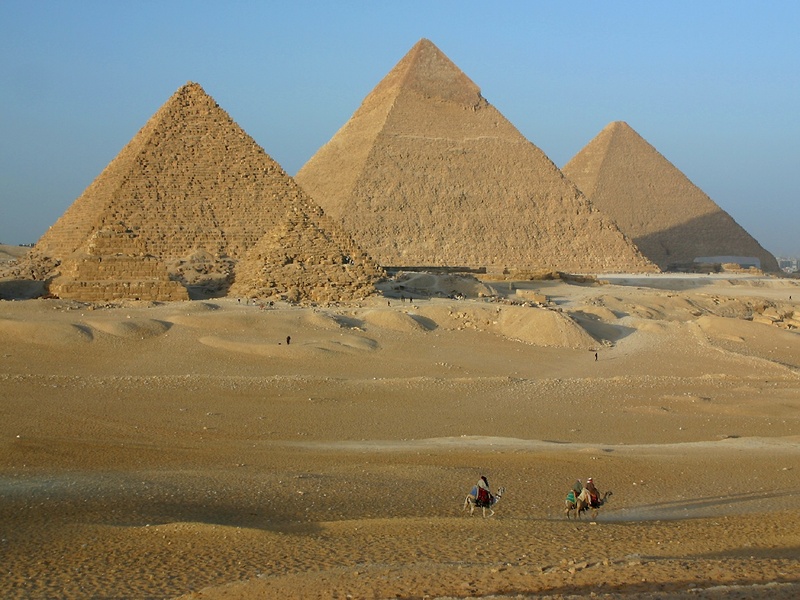 How does the Great Pyramid contain all this? Let's start with the four elements. Each of the pyramid's four sides represents one element. Our bodies have the four elements of Earth (that which gives us substance), Air (allowing us to breathe), Water (over 85 % of our total body mass), and Fire (what keeps our inner temperature at 98.6 degrees), and the Great Pyramid contains these as well. That's it. Simple as that. How does the pyramid display the twelve signs? Easy. According to astrology, each element has three signs. Therefore, each side of the pyramid has three signs - one for each corner of the structure. Earth, for instance, has Taurus, Virgo, and Capricorn. Air has Aquarius, Gemini, and Libra. The Water element contains Scorpio, Cancer, and Pisces. And as for Fire, we find within it the signs of Leo, Aries, and Sagittarius. The Great Pyramid is shaped like half of a naturally growing octahedron crystal: 51 degrees between its slopes and the base. The message? If the pyramid is a crystal and crystals reside within us (and they do, since our bodies return to the earth once we die and help in the formation of crystals), then we should be able to do everything crystals can. And where do we find crystals? We find them in calculators, watches, computers, cellphones, radios, GPS devices, and so on. Eventually we will discover that we are capable of emulating and surpassing our best technological discoveries and developments - simply with our own minds. This might seem like a far-fetched statement to make, but keep in mind that technology does indeed come from human ingenuity (and some would say, from inspiration). What happens to light as it passes through a crystal prism? Answer: it refracts (bends) and becomes visible to the naked eye as the rainbow colored spectrum. The Great Pyramid, of course, may not specifically contain this spectrum since it's a mountain of stone, but since the pyramid is crystal shaped and crystals divide light…you get the picture. Basically, The sun shines into the human body (which, again, contains crystals) and reveals the seven chakras. Take a second look at the Great Seal on the back of the American dollar bill. What do you see at the top of the pyramid? An eye. Now why in the world would an inanimate stone structure have an eye - unless the structure itself wasn't inanimate at all? 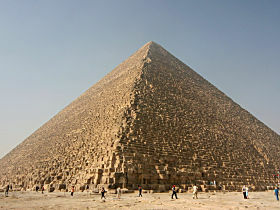 If the Great Pyramid was designed to represent the human body, then it stands to reason that it would be equipped to see as a human would, wouldn't it? After all, they say that the eyes are the gateway to the soul. And no human eye can see as clearly or as deeply as our spiritual third eye. Random rant: The Great Seal of the United States of America is not an evil symbol. Get over it. It is a divinely inspired image designed by highly learned men (and women) of very elite caliber. Its purpose: to inspire, to protect, and to elevate humanity beyond its current barbaric state. Kundalini (or energy serpent) seems unrelated to the Great Pyramid, but the truth is that they're more like kissing cousins. Most people involved in esoteric philosophy for instance, are aware of the Mexican Temple of Chichen Itza in the Yucatan and how twice a year (during the spring and autumn equinoxes, to be more precise) a shadow resembling a snake with wings (i.e. Quetzalcoatl, whom the Toltecs of Mexico revered as a God) slithers its way up and down the 364 steps of the pyramid. 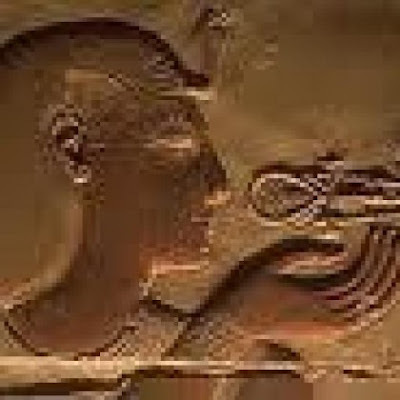 Meanwhile, back in Egypt, the mask of King Tut reveals a cobra protruding from the forehead - with the rest of the reptile's body presumably extending back in the King's body. Just like Kundalini. And then there's Wadjet, the goddess of lower Egypt - another serpent with wings. In fact, there are so many examples of winged serpents or deities with reptilian traits within most cultures of the world that it really makes one wonder if ancient peoples all had access to the same knowledge. I believe they did. The evidence sure shows such. And that's it. That's how the Great Pyramid contains Kundalini - by association. If the above wasn't enough to raise hackles, this might. Actually, it's probably the most controversial concept of all in regards to the Pyramid. because it seems to me that the best way to create chaos (or a distraction) would be to split what was once whole into two parts - and have these duke it with one another instead. "And the LORD God caused a deep sleep to fall upon Adam and he slept: and he took one of his ribs, and closed up the flesh instead thereof; And the rib, which the LORD God had taken from man, made he a woman, and brought her unto the man. And Adam said, This is now bone of my bones, and flesh of my flesh: she shall be called Woman, because she was taken out of Man." I'm not a religious man. But I'm also not for discarding ancient texts before their time - especially if they possess much we've yet to fully comprehend. All I can say about Genesis is that we are explicitly told of a time when the first human being - a man - was both male and female at the same time - and that at some point, something happened to this being where "he" decided to split up into two parts, whereas each half had what the other lacked. 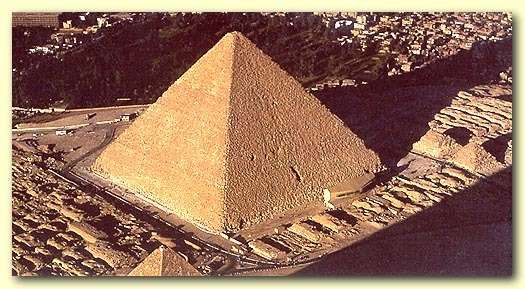 As for how the Great Pyramid contains this, well, that's easy. At the present time, there are only two main chambers within the Great Pyramid: the King's Chamber, and The Queen's Chamber. Male and female…within one structure. One body. Us. The Human Pyramid: The Overall Message. If we become the Pyramid, we save ourselves. That is what I feel the structure is trying (and has tried) to tell us over the centuries. The nice thing about the ideas above is that they aren't really new at all. They've been around forever and simply require an artist's touch to weave together. They also render the Pyramid's age, size, weight, and mass almost irrelevant. It is the implied symbolism and angles that matter. Seen under that light, the "Great" Pyramid could have been built only an inch high and made out of chocolate and the message would be the same. Of course however, having a huge stone structure makes it less likely to be stolen or destroyed. In the end, Man is not known for his sense of introspection. He is known for reason, force, his lust for control, and war. Fortunately, like nightmares seeping away in the first kiss of the morning sun, old paradigms will fade. Our kind will embrace new ways of thinking and relating with one another, ones allowing us to become - or rebecome - as we once were. And when that day arrives, we will no longer require monoliths of stone to reflect our image. *Compared to the Great Pyramid, the Chicago Twin Towers are 4 ' 10" high without the space between floors. 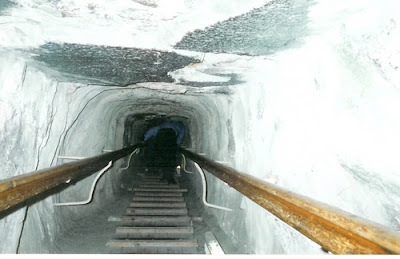 *All the masonry to build a highway from San Fransisco to New York 8' wide and 6" thick - fits inside the Great Pyramid. 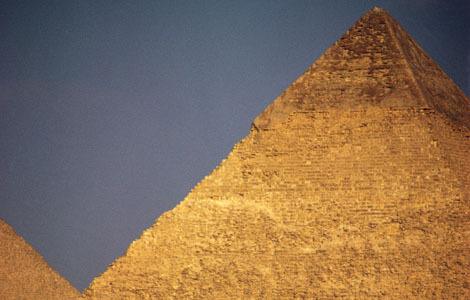 *Only a few places on earth could hold the weight of the Great Pyramid. 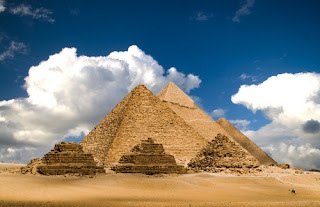 *The height of the Great Pyramid is equal to the average height of land on earth. *The Great Pyramid sits in the center of the longest land parallel and meridian, equally dividing all four quadrants of earth's land masses long before Columbus. *The Great Pyramid was covered with mirror smooth casing stones, 20 tons each, with a smoothness "equal or better to that of your reading glasses." *There were 144,000 of them. *It is the only structure that can be seen from space. *The space between the stones is smaller than a human hair, or piece of tin foil, exact to the thousandth of an inch. Today's technology can move stones 10 to 20 tons each to within 1 or 2 inches of each other. *The most accurate macro manipulator (precision movement of large objects) from NASA can move items only 1 and a half tons to within 50,000th of an inch, not 1 or 2 thousands as in the pyramid. *In aiming toward True North, the Pyramid is off by 3 minutes of arc. The best modern science can achieve is 6 minutes off. *Since the Pyramid was built, there has been a movement of the North Pole. At the time of its erection the Great Pyramid was only .001 off True North. *The greatest scientist of all time, Sir Isaac Newton, broke the code of the Great Pyramid by discovering what he called "the Sacred Jewish Inch." *After studying the Great Pyramid, Newton dedicated the rest of his life to Bible study. *The periphery of the Great Pyramid is 36,524 inches. Moving the decimal reveals the exact length of the earth year. 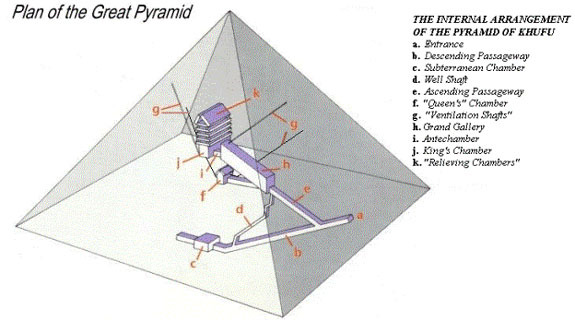 *The Pyramid is the most heavily measured structure on earth, to within a thousandth of an inch through lasers, etc. *Measuring up the ascending passage to the year 33 a.d. one finds the start of the Grand Gallery, and the exact date of April 3, 33 a.d. Here is found "the Christ Triangle," incorporating the angle of the passages we find September 29, 2 b.c. as the birth of Christ. The third leg of the triangle points to the date Octover 14, 29 a.d. - the baptism. *The Pyramid points out 1914 - the start of World War I. The architect of the Great Pyramid knew the exact length of the solar year, even to the tenth part of the second. This is shown in at least six places, and by means of four units of length. There is a second period known as the stellar year, or sidereal, year, about 20 minutes longer than the solar year. Thirdly there is another length called the orbital or anomalistic, year, which is in turn a few seconds longer still. And these two latter year lengths are also enshrined in the Great Pyramid. The "Precession of the Equinoxes", a period of 25,827.5 years, the time required for our solar system as a unit to make one revolution around its vastly greater sun, the Pleiades's, is shown exactly in the pyramid in four places. 1. The mean distance from the earth to the sun. 2. The weight of the earth. 3. The mean density of the earth. 4. The fact of the spherical of the earth. 5. The polar diameter of the earth, or the exact length of earth's polar axis of rotation. 6. The earth's mean orbit and maximum variation. 7. The variation of the earth's ecliptic. 8. The earth's mean temperature (the average temperature of the air in the Kings chamber). 9. The exact inch, foot, yard, furlong and mile, including the true length of the Standard Geographical Mile, a measure of 2917.467+ Pyramid Cubits. 10. The exact grain, ounce, pound, stone, (English weight of 14 pounds) and ton. 11. The standard British (and American) measures of the pint, quart, gallon, bushel and "quarter." 12. The art of squaring the circle in theory and in practice. 13. The art of doubling the cube, likewise in practice as well as in theory. 14. The art of that extremely difficult mathematical feat of offering a practical solution to the baffling problem, the quadrature of the circle. 15. The direction of True North. 17. The total land-area of the earth, the pyramid located in such a manner as to divide said land-area into four equal quarters, and in so doing to thus define both the earth's "master-meridian" of longitude, and "master-parallel" of latitude. In other words, the meridian passing over the Great Pyramid from north to south traverses more miles of land, and less of sea, than any other that can be drawn around the earth at any place, and that same distinction holds true of a parallel passing over the Pyramid's apex from east to west, or vice verse.